Insight to our recent expert roundup on guest blogging (part 1). Take a closer look at the guest blogging statistics we were able to find. At Referral Rock we love finding ways to increase our exposure. One of the best things that have helped us do that is guest blogging. Though we have a pretty good guest posting strategy and actually end up writing a good handful every month… It got us thinking. What do other marketers do? And how many guest posts are they writing? So we turned to the experts to see their approach to finding and writing guest posts. We had 70 responses to our survey, within just a week! Which is far more than we anticipated. And also the reason we had to break this article into two pieces! Before we get to the expert’s advice in article 2, let’s focus a bit on the statistics we found. 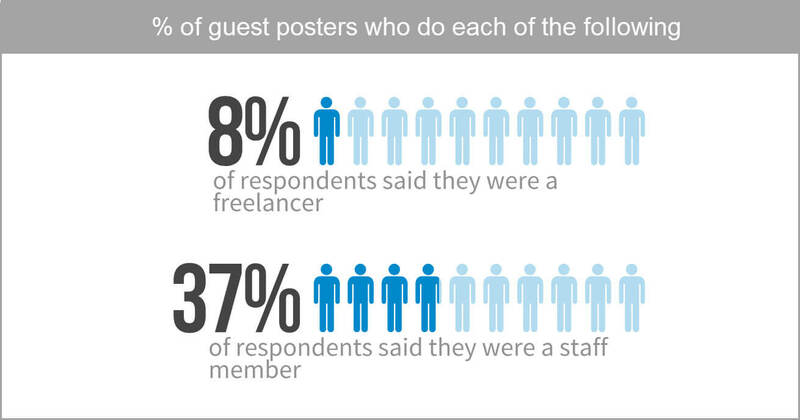 We surveyed 5 questions about guest blogging. Our first 3 questions were multiple choice options, while the last two were open-ended (and will be discussed in our expert tips on guest blogging article). The first three were important for us to ask because we wanted to know if we were on par with what other marketers are doing. So we decided to start with these two questions. 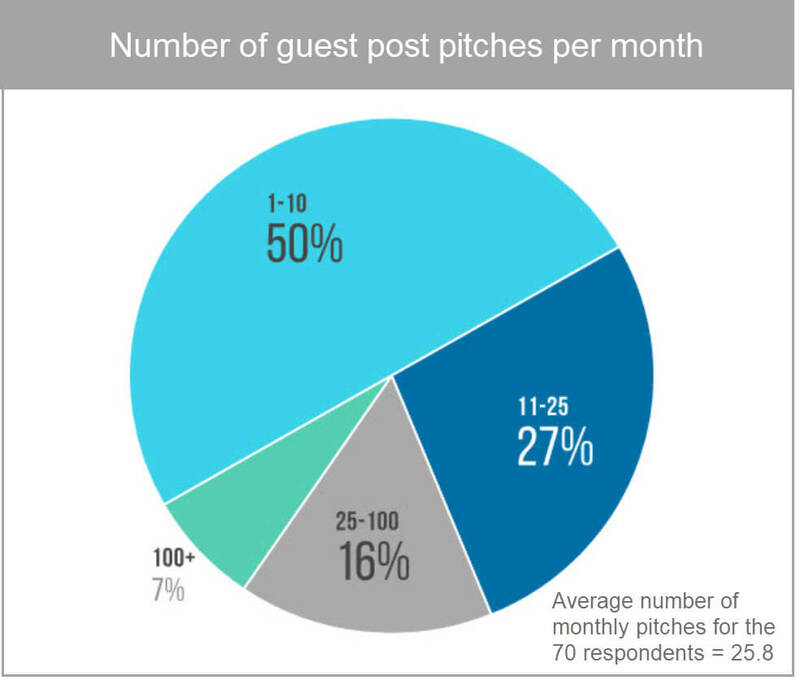 How many contacts a month do you pitch a guest post to? How many guest posts do you actually end up writing per month? Our third question was more variable. We realized that not everyone responding would be in the same situation. So our third question was asked so we can see who is doing what role in content marketing. 3. Describe your content marketing role, in which we asked respondents to check all that apply. You’ll see the options below. These multiple choice questions left us with a few great findings. How much guest post outreach should I do? At Referral Rock, we reach out to 10 or fewer contacts a month. This got us thinking, what’s the typical amount of outreach and pitching that people usually do? 5 of the 70 respondents (7%) pitch to 100 or more blogs per month. As it turns out, we’re not far off from the majority. In fact, 50% of contributors reach out to for guest posts over email to 10 or fewer contacts a month. How many guest posts do most blogs write per month? More than half the respondents mentioned that they actually end up writing just 1-5 guest posts per month. 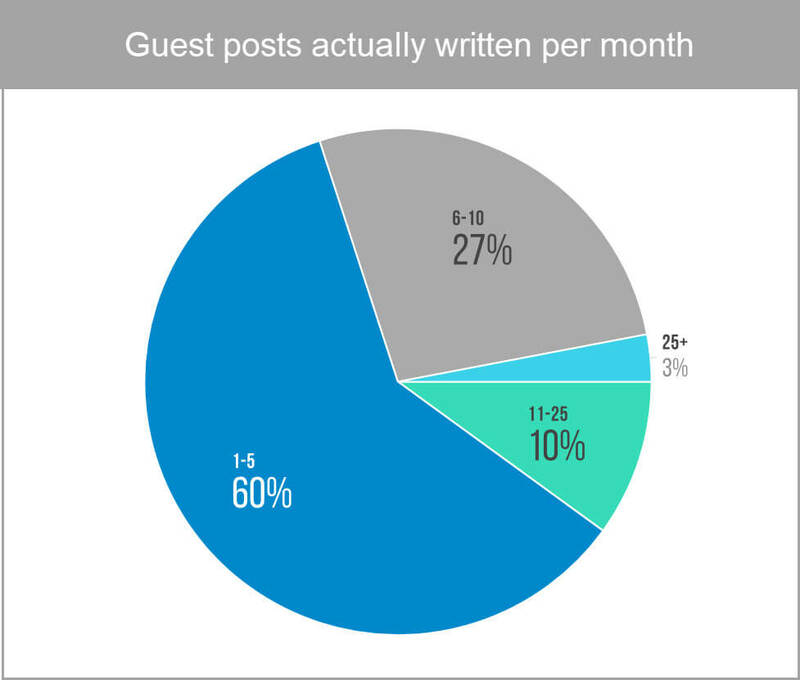 More than half (60%) responded that they write 1-5 guest posts per month. We found it interesting that only 2 of the 70 respondents actually write more than 25 guest posts per month. That means 3% of respondents write 100 or more guest posts every month! What’s that mean? On average, guest bloggers post about 6.6 articles per month. How close is that number to the amount you guest post? For us, it’s pretty close. What roles are involved in guest blogging? We found that a lot of the respondents play multiple roles when it comes to writing and doing the guest post outreach. Most common include doing the reaching out, writing, coming up with the topic, and doing the prospecting. We provided multiple options for the experts to choose from. Most surprisingly, we found that 81% marked that they were the ones who decide on guest post ideas and topics. 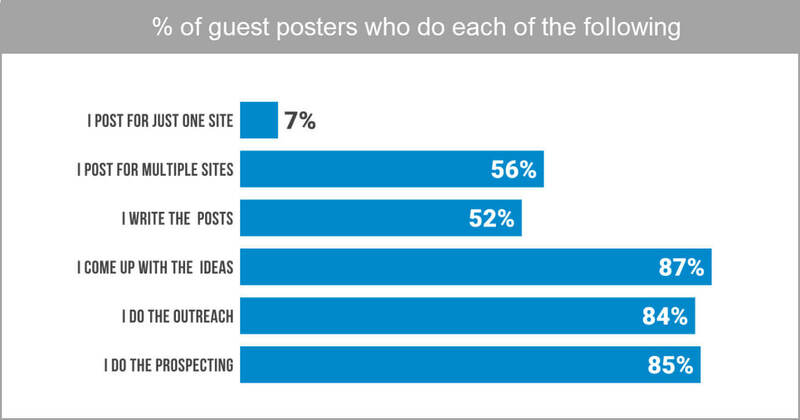 65 of the 70 respondents come up with the guest post article ideas. While most respondents confirmed they do the prospecting, reaching out, and come up with the topics, only around half (49%) actually write the guest post. Though many did not choose their exact role (freelancer or staffer) we can see that far more respondents were staff members. For many businesses, guest posting is necessary, but it’s not the main priority. Which is why most people focus their efforts on trying to write for just a few quality blogs. To recap, the majority of marketers tend to reach out to 1-10 people a month and end up writing 1-5 articles per month. Therefore, Referral Rock is right on par with many others are doing. What about you? Are you doing the average guest blogging, or are you going above and beyond?